Upon first look, The Big Bang Theory doesn’t look much. It is created by the man who created Dharma and Greg and Two and a Half Men. If at least one of those credentials doesn’t seem like a humourless vacuum, then there was never any need to worry about The Big Bang Theory. But for people who like something a little more from a sitcom, there was cause for concern. There is a little more cause for concern when the premise is revealed. A fish out of water sitcom about a group of geeks living near a pretty girl doesn’t inspire confidence. Thankfully The Big Bang Theory is actually quite funny and season two continues with the misadventures of Leonard and the gang, and shows the sitcom has a sustainable formula. The basic set up involves two Caltech physics prodigies, Leonard and Sheldon. They live across the hall from attractive waitress Penny, who dreams of being an actress. 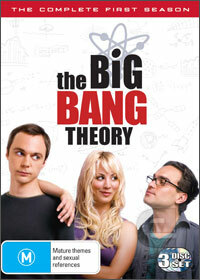 The cast is rounded out by Rajesh and Wolowitz, Leonard and Sheldon’s equally geeky friends. Season two continues to play on the sexual tension between Leonard and Penny, but never jams it down the viewer’s throats. Instead we are treated to many adventures the boys encounter and how Penny reacts to them. These involve any number of things, such as building a fighting robot, trying to pick up girls, reading comics and figuring out insanely complicated physics equations. The show often treads two territories, the first being a classic clichéd sitcom that is more often groanworthy than not. The other is an endearing and sometimes laugh out loud funny sitcom with some great performances by its lead actors. This is mostly due to the creator’s reverence of the four main geeky characters. The Big Bang Theory is never mean spirited, and its references to nerd culture, be it vintage video games, Star Trek, comics and theoretical and experimental physics are clever and give the show an extra layer of humour if the source material is known. The other main thing that separates The Big Bang Theory from the pack is Jim Parsons performance as Sheldon Cooper. Sheldon is a one of a kind character on TV, neurotic to a fault, incredibly smart and unable to pick up the most common of human emotions or interactions. He is Spock, transported into a sitcom in the present day, and Parsons performance of him is wonderful. If it were not for this performance, The Big Bang Theory may go from being one of the better sitcoms around to an average one. It also seems like the writers have a good bead on this, never over doing Sheldon or making him the main focus and forcing him into every situation. Highlights of this season include “The Terminator Decoupling”, where the gang meet Summer Glau on a train and all theorize methods to pick her up, “The Barbarian Sublimation”, where Penny gets addicted to online RPG ‘Age of Conan’ and “The Lizard Spock Expansion”, which shows Sheldon’s expansion of rock, paper, scissors. The collection of episodes holds up after repeat viewings, if only just to understand all of what is being said by the characters. Extras are sparse, there is a slightly amusing gag reel, and two featurettes. The more interesting of the two focuses on UCLA professor David Saltzberg who is the staffs creative consultant. He makes sure all the math is correct and even contributes dialogue, to make the characters sound more authentic. The other is just the stars and creator discussing the development of the creators. It isn’t essential, but will be interesting to fans of the series. It could have all gone horribly wrong, but The Big Bang Theory is refreshingly good. The characters are all amusing and engaging, the performances are solid, and the nerd references lift it a notch above regular sitcoms. It still isn’t the best sitcom currently on TV, that award stays with How I Met Your Mother, but this is still an impressive effort.